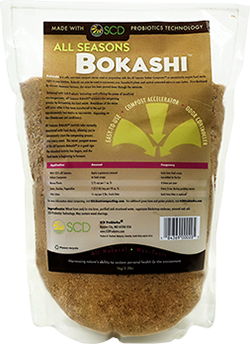 In addition to the specially designed All Season Indoor composter®; the key to the kit is the use of All Seasons Bokashi™. Here’s how it works. Bokashi is a Japanese term that means fermented organic matter. When bokashi is added to food waste, the fermentation process begins. The specialized composting bucket excludes oxygen, while the healthy microbes in the Bokashi start to feast on the food. The healthy microbes (or probiotics*) are living organisms so small that they are only visible with a microscope. The microbes in All Seasons Bokashi™ include Lactobacilli, fungi/yeast, and phototrophic bacilli. This combination has been proven to rapidly degrade (ferment) organic waste while suppressing the growth of other potentially dangerous organisms…. which explains why there is no foul odor during this process. *Probiotics are by definition, healthy microorganisms that when applied in sufficient amounts, provide a health benefit to the host. Check out SCD Probiotics, a leader in the manufacturing of probiotics, for more information.